The ever-fabulous Scary Mommy made a list of inspiring books for moms who need a pick-me-up. My essay is in #4! That’s a personal pick-me-up! There were cracks these last few weeks, some of which turned into those seismic shifts that create a new normal. Life sometimes grabs us by the shoulders, to shake us or to steady us. 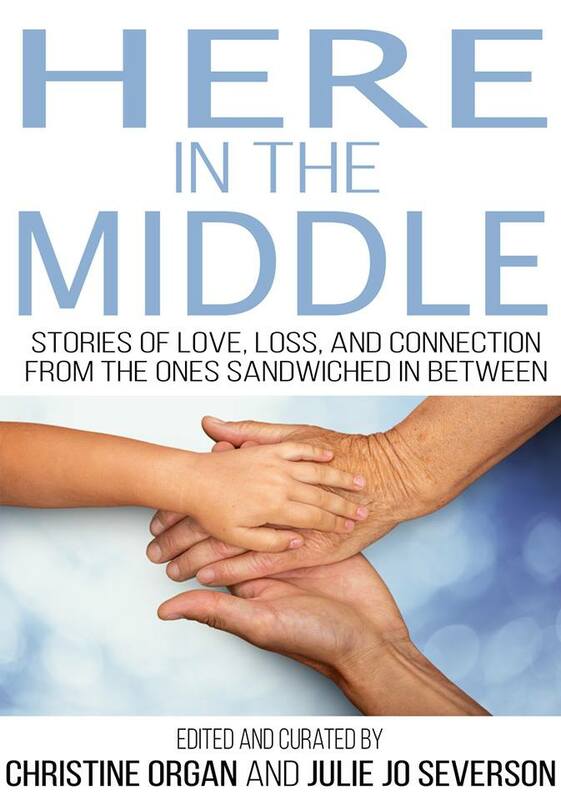 I recently participated in a book launch and signing for Here in the Middle. It was a joy to finally meet up with writers I’ve long been fans of and have met only virtually. They are just as clever and brilliant and open and lovely in person as on the page. I, on the other hand, was a bit of a dork. In other words, completely myself. Both as the book reaches wider audiences and also my own life continues down whatever path this is, I ripple effects from the stories are that much more poignant. I find myself returning to these pages that I devoured when I first received my copy, and now am rereading with intention. The words feel familiar and yet strike me differently each time. I love a book who grows with me. I was prepared to speak at the book launch if need be. And by “prepared” I mean I had scripted a little something on a sheet of loose-leaf in the car before I walked into the event. I find that usually if I have the words in hand, I don’t need them. The act of writing them down places them in a comfort zone in my brain, and I tend to not need them. In the interest of honesty and never missing an opportunity to embarrass myself, I will share that my genius methods of giving my brain the equivalent of training wheels do not always work. The other week I had the opportunity to speak at a meeting for new teachers – not about my book, but because I am the PTO co-president (*hold for laughter*). You’d think this task would be easy. I know the topic. I like the teachers. It’s a friendly audience. I had pamphlets for goodness’ sake. And I went and got nervous. My breath got caught in my chest. I was shaky. Rather than stay in the moment, as we say in improv, I was in my head, listening to myself in something between shock and amusement. The funniest part was that these lovely teachers all had this look on their face, with heads tilted like you can do this! We’ve got your back! So I emoted it out by watching This is Us. I am committed to the unapologetic heartstring-tugging. And also to Sterling K. Brown, because he is made of awesome and starlight. Because sometimes when life grabs you by the shoulders, that is as much the new normal as anything else. Here in the Middle is out! I always thought middle age would be softer. I thought my hair would be poofy, my body would be poofy, everything would have an easy-to-sink-into quality to it, like an overstuffed chair. With the exception of my body, I’m finding middle age to be hard and sometimes sharp – and that’s when I acknowledge that I’m in middle age in the first place. I am edgier. My opinions are strong. Getting through the day can be hard. I feel increasingly unsure about the world as I grow surer of who I am. It is a great reversal, as I used to be confident about what the world was all about and have a tenuous sense of self. That crisscrossing of certainty and uncertainty, of confidence and grasping, of hard and soft runs throughout the new anthology Here in the Middle, which was released yesterday and to which I am a proud contributor. A mishmash of emotions always accompanies releases of new art. Pride and excitement, certainly. There is also worry that it won’t be received as it was intended, that the circle of audience and performer will not be closed. That worry is unfounded with Here in the Middle. This collection of stories already resonates with many people who are in the so-called sandwich generation. And while it’s not necessarily a bad place to be (who doesn’t like sandwiches? ), it can be tough. It’s surprising to find yourself in a time when we all watch our children venture out into the world to various degrees, and then need to turn a watchful, caring eye to our parents. It is a book of transitions, of moments where time stands still just long enough for us to realize not only how fast it’s all going but how much we change. How much we need to change. That we sometimes are forced to change be it under volcanic pressure or gentle yet persistent buffing. My story, “Grandparent Privilege,” is a humorous look at one of these moments in my life. My role as “caregiver” is tenuous at best: my parents are healthy and active, my children run away from any of my attempts at caregiving, which mostly involves my asking if they washed their hands with soap. I wrote about being the odd man out in the relationship between my children and my parents. It is a love note to my parents, my children, and my steadfast husband who wishes we would drop them off at my parents much more often than we do. You can read my story and many other beautiful, heartwarming, sometimes heartbreaking, always lovely stories by purchasing the book on Amazon or Barnes & Noble. I would love to hear your thoughts on the book!